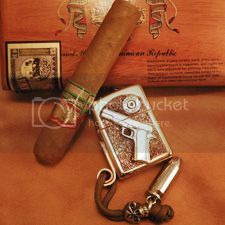 Aficionados know that Zippos are not ideal for firing up premium cigars. The strong aroma of the lighter fluid used in such devices can lend a harsh taste to your cigars, particularly those of the milder variety, unless you take care when torching up and keep the flame away from the end of your smoke. But no one can deny the beauty of a Zippo, wonderfully simple and reliable devices that have a pleasant heft and a distinct look of Americana. Artist Mike Porter uses Zippos as his canvas, taking the lighters and turning them into one-of-a-kind, eye-popping creations featuring rugged imagery. His Wicked Zippo Studios makes imaginative lighters that make an immediate impression. His designs include coins, skulls and golf balls, each casted in sterling silver or bronze then artistically attached to a Zippo lighter, which is decorated in various styles to make it unlike any other Zippo you've ever seen. Each can be customized to your liking and sports a lanyard attached to the side. "The lanyard is kind of a signature feature for us and it enables the customer to carry their custom Zippo inside their pocket with the lanyard and skull bead hanging outside their pocket," says Porter. "It also makes it easy to yank your Zippo from your pocket." Wicked Zippo has several styles of pre-made lighters beginning at $99 and ranging to more than $700, depending on style, and it can make fully customized items. And although he uses a Zippo to light his own cigars, Porter knows that purists go for the odorless flame created by lighters that run on butane, so he will throw in-free of charge-an aftermarket insert that allows his lighters to throw a butane flame. Dat is wel een hele koele aansteker mooi gemaakt.